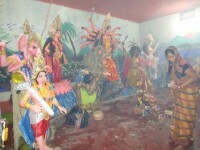 It is the story of an artist Drishya during the height of civil war in Nepal. It is part love story as well. It dwells, not only, into the effects of the civil war on Nepali countryside that the male protagonist travel to, but also takes about the blooming love between Drishya and the first generation American Nepali, Palpasa. Drishya, an artist by profession, liked to travel around the countryside and the places that he travelled were deeply affected by the civil war. There was no security and guarantee of human life, as no one know when, what was going to happen. During one of his travel, he met Palpasa, a first generation American Nepali who had come to visit her parent’s birth land, Nepal. After few meetings, conversations and discussions, gradually they develop liking to each other and it blooms to love. However, they could not confess it outright and express the love with a letter. The ongoing civil war cause havoc not only in the country and the countryside but also into the live of these two characters. The consequences and dreadful state of the country and its people caused by the war is tactfully expressed through the eyes and life of the character Drishya. Published in the year 2005, Palpasa cafe was and is one of the best selling Nepali novels with its 25000 copies sold in its first year of publication. Published by Nepalaya, the book was originally printed in Nepali and was later translated to English and Korean. 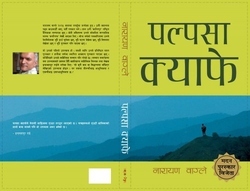 First novel by the prominent Nepali journalist, Narayan Wagle, Palpasa café also received many awards and honors including the most prestigious literary award of Nepal, Madan Puraskar. It is available in hard cover as well as paper back and it is the first ever Nepali novel to be available in kindle. Portable and eBook formats like mobi and pdf are also available for the book. Often considered as an anti-war novel, Palpasa café is a good read.